SUPERNATURAL 11x02 Gallery: "Form and Void"
Sam’s been infected, Dean’s attempting to help the defenseless, Cas is being tortured, and Crowley is sipping tea while making a mockery of a religious institution. Overall, it looks like just another day on the job for the Winchesters in these new images from Supernatural’s October 14 episode. “Form and Void” will see Dean (Jensen Ackles) assisting Jenna (guest star Laci J. Mailey), the nurse he met after the Darkness fell, get back home safely. Then it’s off to help Sam (Jared Padalecki) deal with a town infected by a mysterious and deadly gas. “Form and Void” airs Wednesday October 14 on the CW. Catch more Supernatural scoop from our Twitter @ScreenSpy or Facebook ScreenSpy. 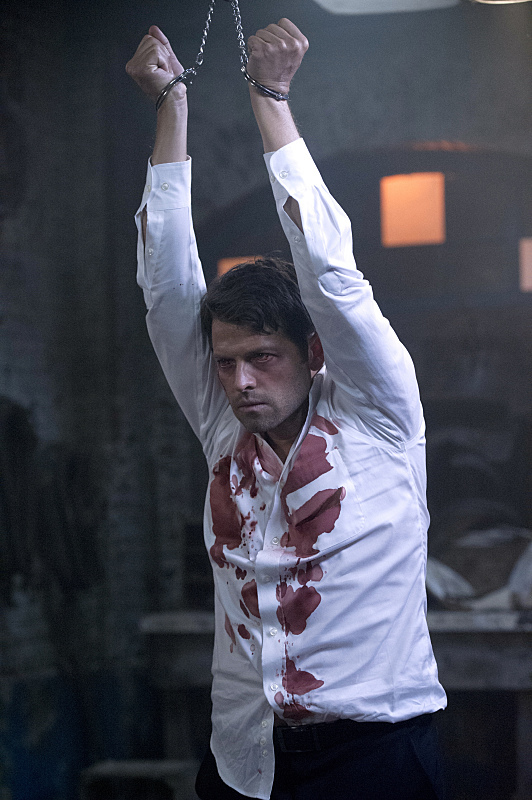 Supernatural -- "Form and Void" -- Image SN1103B_0327.jpg -- Pictured: Misha Collins as Castiel - Photo: Carole Segal/The CW -- ÃÂ© 2015 The CW Network, LLC. All Rights Reserved.